Comes with the complete Java code of 6 example apps. E-Book (PDF) available for $29.95. 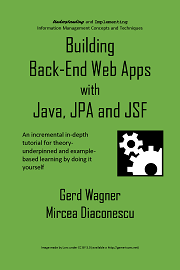 This book shows how to build back-end web applications with Java, JPA and JSF. A back-end web app is a distributed web app where essentially all work is performed by the back-end component, including data validation and UI page creation, while the front-end only consists of a web browser's rendering of HTML-forms-based UI pages.